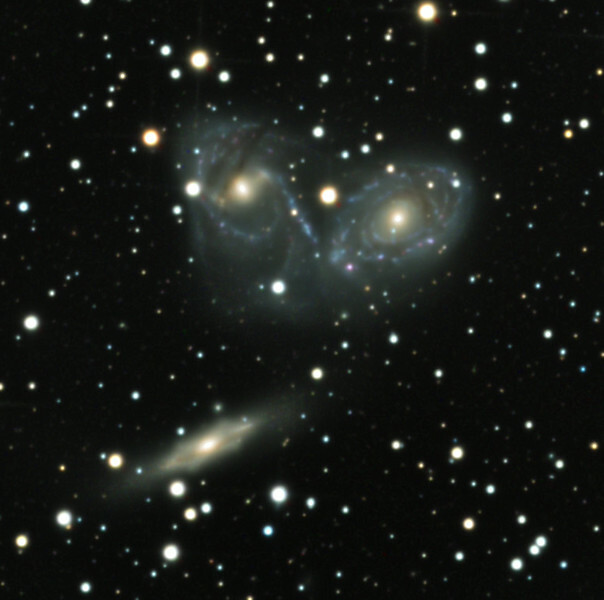 Tight crop of Devil's Mask interacting spiral galaxies NGC 6769-70 and edge-on barred spiral NGC 6771. Field is only 9 min arc across. Notice the dust lanes of 6770 have been twisted up and over the galaxy, as if it has been through an egg beater. See the blue spiral arm pulled straight like a tidal tail. The boxy bar of 6771 appears almost X-shaped in profile. L 13 hrs, RGB 2.5 hrs each.